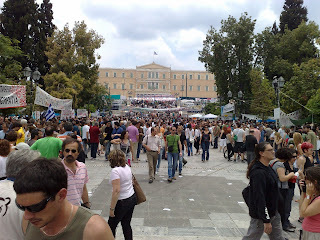 We arrived in Athens to the news of a general strike. This apparently meant that most of the main monuments would be closed (including the Acropolis). We headed into the city regardless, figuring it would still be more interesting than the campsite. We got off at the metro station right near Parliament House, where all the protesters had gathered. There were lots of people there and it was busy, but most of them were standing around with a coffee and a cigarette having a chat! There were also all manner of banners and fliers being handed out, and also a small tent city set up by the die-hard protesters who have been there for months, but in general the atmosphere was relaxed and friendly. Nevertheless, we decided not to stick around. And whilst the Acropolis was closed, the Ancient Agora was still open, there are many parks that surround the ancient downtown sites that are very pretty to walk through (and thankfully have lots of trees and shade - it's hot!) and the very new Acropolis Museum was also open - and that was really very interesting, worth seeing before going to the actual Acropolis the next day, and pleasantly air-conditioned, too. On our way back much later in the afternoon, we ended up passing through the Parliament House station again ... and things were a little different. Exactly the same atmosphere amongst the protesters, with everyone holding a coffee and a cigarette, but there were a few bin fires, a few random olive trees planted in the road, and a strong stink in the air that burned your eyes, nose and throat. It had been a good decision not to stick around. However, we did like the chain of people passing bottles down a line to a fountain, where the bottles were filled, and then sent from the fountain to the fires - clearly the vast majority of people there didn't want trouble, and were happy to help clean up. And day two in Athens? Well the tent city was still in place and many of the protesters were still there, smoking and drinking coffee. And as the Acropolis and other sights were now open, we competed with the crowds to complete our sightseeing.